We have a fun project in the works to help a friend make some renovation and design decisions in her new condo. We finally were able to see her new place in person this week and, wow, it’s fantastic, with amazing views of Lake Erie and downtown Cleveland, and tons of potential. Hopefully you caught our tour of her place on Instagram stories. Our friend’s style is what we’re calling “modern rustic” — think weathered grey wood floors, distressed furniture, exposed pipes… It’s different from what Andy and I do in our own home, but we LOVE to play with different design styles (we often daydream about owning like ten houses all with totally different styles… if only we won the lottery, ha). 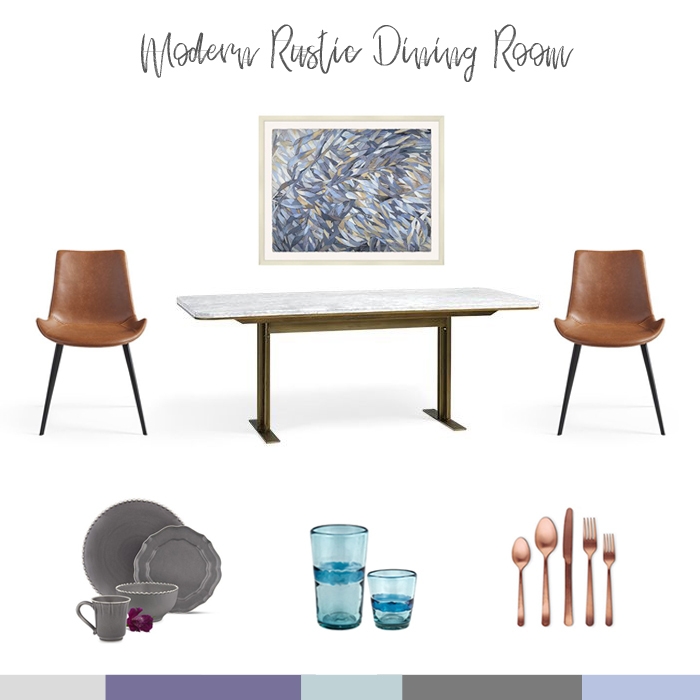 So when we recently came across the furniture company Arhaus, we were inspired to create an inspiration board for a dining room in this modern rustic style. There are so many great dining room tables and chairs in the Arhaus collection, it was hard to narrow it down, but I fell in love with the Massa Kitchen Table with its Carerra Marble top and antiqued brass base. It’s the perfect combination of traditional and modern — I could just as easily see it in our modern home — but it also fits perfectly into a rustic backdrop, especially when paired with these gorgeous faux leather chairs in my favorite caramel color. I love the juxtaposition of cool and warm and hard and soft for this space — marble and leather, grey dishes and copper silverware. And can you imagine this room with floors like these? So pretty, right?